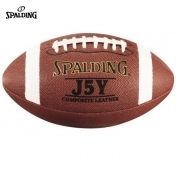 In 1887 Spalding develops and manufactures the very first American football.Each ball is made from the finest quality leather and features rawhide lacing. Every ball is guaranteed to be "perfect in material and workmanship, and correct in shape and size". In 1992 Spalding is the first to develop and introduce composite leather cover materials. The new technology makes the ball more durable while providing a super soft touch for greater feel and control vs. traditional leather. Spalding J5J keinonahkapallo juniorit 9-11 v.
Spalding J5Y keinonahkapallo juniorit 11-14 v.